This interview took place on: 1/19/11. JFH (Jen Rose): So we'll get started with introductions... because a lot of people know "Give Me Your Eyes," but for people who may not know you so well, what is one thing you would like everyone to know about you? Brandon Heath: Um, everybody should know that... I collect license plates. Brandon: Mmhmm. Old license plates. I have every state in this great United States of the year 1978, which is the year that I was born. I just think they're cool. They're like little mini-signs, you know, and they rode on the back of somebody's car at one time. So they have like, lives of their own, and I think that's kind of cool to collect. And they're flat so they pack well. But that's a weird, quirky thing about me that most people don't know. JFH (Jen): That's cool. Do you have like a place in your house to hang them all on the wall? Brandon: Yeah, at one point I had like two walls full of license plates. I haven't really been collecting lately. I kind of got over-inundated. I was going on eBay almost every day buying license plates, and I'm like, "this is an addiction, I need to cut it out." So I've chilled a little bit on my license plate collecting, but I am a member of the NLPCA, which is the National License Plate Collectors Association. Active card-carrying member. JFH (Jen): So how would you describe your new record Leaving Eden to someone who doesn't know your music? Brandon: I would describe it as acoustic pop. Maybe more pop with acoustic in it. I used to be more acoustic pop, but now I'm just like pop. It's got a lot of beats to it, but know that I am a songwriter, and lyrics are still the priority for me, so I spend a lot of time on my lyrics. And I have like a handful of guys that I write with. So I'm kind of picky on the co-writing. But I would say it's pop music with, you know, deeper than usual lyrics. JFH (Jen): Not fluff pop. Brandon: *sarcastically* I'm very deep. *laughs* You guys should also know that too. Very deep. JFH (Jen): Who are some of the people you work with? Brandon: Well, I'm a country music fan, and Nashville is full of amazing country music writers. One of them, Lee Thomas Miller, wrote two of the songs including the title track, "Leaving Eden," with me on this record. He also wrote "Only Water" on this record. So those were the two songs that we wrote together. But Lee won last year Song of the Year at the CMAs for "You Should've Seen It in Color." That was his big song. I wrote with Jason Ingram on this one, the guy that I wrote "Give Me Your Eyes" with. And pretty much any number one hit you hear lately on the radio is a Jason Ingram song, so I feel like I cheated a little bit writing with Jason. But Jason and I have been writing forever, and we wrote you know, "Give Me Your Eyes." And that was the last song we wrote together, so we felt a little bit of pressure on this one to deliver like we did on the last one. But "Your Love," which is the first single, was the first song we wrote for the record back -- I remember it was January 4th. And I co-wrote a lot with my producer Dan Muckala. Dan and I have like four co-writes on this one. And everything else, I think, I wrote by myself. JFH (Jen): Is there a theme or a story behind Leaving Eden as a whole, like a general concept you were going for? Brandon: Yeah, there's a few ways you could look at that statement. "Leaving Eden"... I mean it states the obvious. We are leaving what was perfection. We're still actively walking away from it, and there's a long road back, a lot of history, a lot of water under the bridge. I really kind of want to mourn what happened in Eden, because I feel like we all feel the repercussions of that, which is sin, but also if we're leaving, I would like to be walking in the direction of Heaven, walking in the direction of hope. And so I wanna examine my own life and see what are the things that are pulling me away from Eden? And what is my apple? You know, what is my knowledge of good and evil? There are several things that I feel pull me away from Eden. And then the rest of the record really talks about hope. So I think it's okay to lament a little bit, you know? In the Psalms there was certainly a lot of lamenting, but there's also rejoicing in knowing that we're headed to a very glorious place. And I feel like I'm full of hope for that. Brandon: Well, "Your Love" is the second song on the record, and it's "I know my innocence was taken, not everything is lost." So I immediately wanna say "let's not dwell on the fact that we've lost our innocence, but let's take responsibility for our own lives and figure out what we can do constructive with what we've got." JFH (Jen): Yeah, kind of make the world around you a little bit better the best you can. Brandon: Yeah! I think so. And then maybe not dwell so much on bad news, but maybe create good news. JFH (Jen): What's the story behind "Your Love?" Oh, and congratulations on it going number one (on radio)! Brandon: Thank you! Yeah, that's pretty cool. "Your Love" was written with Jason Ingram, and Jason and I had prayed that first morning of writing that we not write under any pretense or any pressure to deliver a hit. Which I love that it is a hit now, but that morning we just wanted to write it, we wanted to keep it simple. And we feel like if God put any priority over everything, He would just want people to know that we're loved, you know? Like, He just wants us to love each other and love Him, He would want us to know that we're loved. So it really hinges on love. I wanted to maybe talk about maybe some accomplishments, like climbing a mountain, whether it would be the corporate ladder or literally climbing a mountain, all these achievements that we make in life don't really mean a hill of beans if we don't understand that we're loved. So even if we fail, when you're loved, it doesn't matter if you fail or succeed. You're just covered, you know? And that makes you, I think, lead a much more confident life, knowing that you really can't fail. JFH (Jen): Do you have a favorite song on the album? Brandon: Right now... I think my favorite song is "Stolen." There's just something about that song I keep coming back to. It has a great beat to it, but the concept on it was about a pursuer and a runner, and there's this passionate chase happening, and that's what's going on between us and God. He's passionately pursuing us, and he's never stopped. And I love that! Like, just hearing that, I kind of wanna say, well, if I'm passionately being pursued, I kind of wanna stop running, you know? I just wanna be caught. That's really what the song is about. JFH (Jen): What music have you been listening to lately? Brandon: Hm, who have I been listening to? I bought the new Decemberists record last night on iTunes. It's good, it's pretty chill. It's got some country influences on this one, a little bit more than the last one. Um... who else have I been listening to? I just recently discovered George Jones, who's a country guy. He's an old-school country guy. But I downloaded the Essential George Jones from iTunes, and it's all of his old hits from like the 50s and the 60s and the 70s. It's really cool. I love George Jones. He's got this really definitive country voice. JFH (Jen): Who are some of your favorite songwriters and inspirations in writing your music? Brandon: Jonatha Brooke is one. David Wilcox. The Indigo Girls. Sting. Ryan Adams. And.... maybe more recently... Justin Bieber. Just kidding. *laughs* Uh... who is somebody a little more... I love Brad Paisley. Brad Paisley's really good. Vince Gill is another one. Those guys are pretty brilliant country writers. So those are two that I study at least. I'm a student. (Jen: Of lyric writing.) Yeah. Love a really clever lyric that comes around in the end. Like a song that will make you laugh, but then in the end it can make you cry. It has this ability to run the gamut of emotions, and I think country does a really good job of that. JFH (Jen): Okay, I'm... gonna admit that I... am not very familiar with country music. You're making me want to get educated there. JFH (Jen): Sure, and I think that's the problem, because I guess that's the stuff that usually gets really big. Brandon: Yeah, but you know what's cool? They embrace it. Like, they're not ashamed of it, and I kind of like that. It's like, I really love Norman Rockwell paintings, because he paints the normal person, you know? And he captures these really great moments in his paintings. And I think country music is like Norman Rockwell. They capture like, everyday man moments. Like, I call it a Walmart love story. You know, everybody goes to Walmart, but not everybody has the same whimsical, amazing love story. Some of them are a little... they're just not... traditional? But they work. And I think there's something really intriguing and cool about that. Brandon: Uh, country-wise? (Jen: Yes!) Get the newest Miranda Lambert. Get Carrie Underwood. She's pop, like country pop. Keith Urban is really good. Annnnnd... Eric Church. He just came out with a new record, so I haven't heard the new record, but his last record was really good. Eric Church. There you go. JFH (Jen): Cool. Thank you. What is the best piece of encouragement or advice you've ever received? Brandon: It involved me being here in Orlando, actually! I went to see a friend take off in a space shuttle. It's a guy that I met when I lived in Houston who had never been in space -- he was an astronaut, but he'd never gotten to go to space, and then got the phone call that he was gonna be pilot on STS-130, which was the mission, and that was back in February, 2010. And I got to come down and see the launch, and that morning --there's a tradition in NASA that they wake up to a song every morning -- and that first morning in space they woke up to "Give Me Your Eyes." And I have been such a huge NASA nerd since I was a kid. There's another thing you need to know about me! I'm a NASA nerd. Love NASA. Go on NASA.com at least once a day, cause I wanna see what's going on. So I was staying up all night watching that on NASA TV. So I went back to Nashville after seeing the launch, and I was telling a friend of mine about the whole thing and that they played my song that morning. Actually, when I was in the airport, my friend Terry's wife called me and said, "Hey, you need to get online if you can and look at NASA TV." And I saw it live when they woke up to "Give Me Your Eyes," and I just cried cause I was like "No wayyyy, that's so cool!" But my friend told me, "Isn't it just like God to romance you like that?" And I said, "I never thought of it that way!" But my friend Thad reminded me God loves us so intimately that He knows those little details. Even if we don't tell people that we watch NASA or we love it, He still wants to blow us away, and He makes stuff like that happen. So that's probably the most encouraging thing that's ever happened. JFH (Jen): That's really cool! Um... so you sang at Carrie Underwood's wedding! How did that happen? Brandon: It was cool! Her fiancè was a fan of mine and played her my last record, and the reason I found out about her being a fan is that she said something in People Magazine about me. Somebody asked her what was on her iPod, and she said, quote, "I'm in love with Brandon Heath's voice." And my mom saw it in People and called me and told me about it, and it's like, what a coincidence, I'm in love with Carrie Underwood's voice! So I met her at an after-party for an awards show, and she said they were gonna be dancing to "Love Never Fails" at their wedding. And so I just said, "I don't know when the wedding is, but I would love to come sing if I can, and we can make a surprise to Mike." So I went and sang... it was July 10th of last year. (Jen: Aw, how cool!) It was very cool. And it was like top secret... I wasn't even able to talk about it. I never even talked about it 'cause I wasn't able to. JFH (Jen): What a great story... Okay, how do we talk about the "Beard-Off" you were talking about [before the interview]? *laughs* Because that was hilarious. Brandon: Oh yeah... Whiskerino was the name of it! JFH (Jen): Well... tell us about it! Brandon: Well, honestly, I found out about it from the drummer from Leeland [during the Follow You Tour] who has this huge beard. So we all shaved on October 31st, and then the first day of Whiskerino is November 1st and then you grow it for four months until the end of February, until March. So... it's like an investment. It's like a Chia pet on your face that you care for. But the rule is you can't cut it, you can't groom it. So it was nasty. I'll never do it again. JFH (Jen): So you end up looking like this scruffy, like mountain man? Brandon: Neanderthal? Yeah. But it was kinda cool to know I could at least grow a beard. JFH (Jen): And now you know you can grow a much tamer beard. Brandon: Now I can groom and sculpt and be a little less furry. JFH (Jen): Okay, one last question... if you could have any superpower, what would it be and why? Brandon: Oh, I would fly. Not a question. 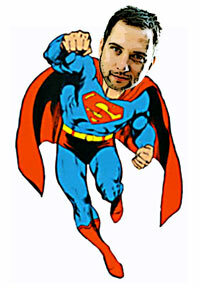 When I was a kid, I really, really wanted to be Superman. Like I would wear this superman outfit everywhere. It was like, you know, when I got home from school-- no. I was too old then. When I got home from daycare, I would want to put my Superman outfit on. And my grandmother made me a red velvet cape. So... yeah, Superman. I would like to fly. Wouldn't that be your super power? JFH (Jen): Mmm... I always leaned more toward teleporting, because I hate traffic and I have a long drive to work. And I like to sleep. So it would be really nice to like wake up in the morning, get ready, and then boom! I'm at work. Brandon: You should be an artist. Brandon: We sleep on buses. We teleport. Yeah, we sleep on buses and we wake up to the next gig. Brandon: It is. And weird at the same time. Imagine waking up in a different parking lot. JFH (Jen): And you wake up like, "Where am I? What city is this?" Brandon: Yes! Totally. But you find out where you are. I get out and see coffee shops and stuff. That's my way of acclimating. JFH (Jen): And that's important. That would be really great actually if I could wake up on a bus and be at work. Brandon: Oh, it's awesome. I'm not gonna lie. And you can sleep until like eleven, 'cause it's dark... it's like sleeping in a little coffin. JFH (Jen): Um, that's kind of spooky. The rocking and the road noise doesn't bother you? Brandon: No... it's soothing. I'm a car sleeper. Any rocking puts me to sleep. That's my style. 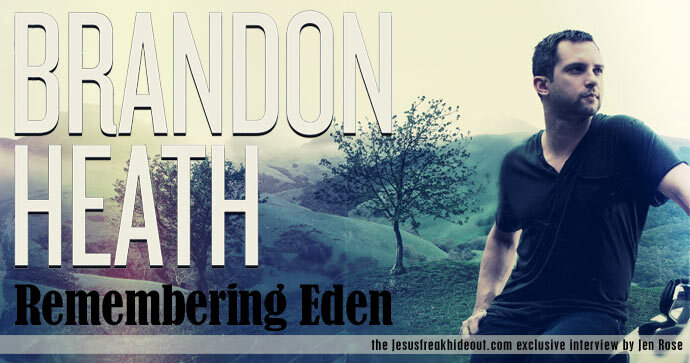 Brandon Heath's new album Leaving Eden is available now!